I have no idea where the month of October, or really even most of 2016 has went. I’m still not completely convinced that the 4th of July actually happened because we didn’t really celebrate it like we usually do. But somehow, we’re entering the month of November and I have to do things like schedule the carpets to be cleaned, plan the Thanksgiving menu and then start thinking about Christmas. It’s also almost the end of the Secret Recipe Club. 🙁 My final posting will be in just two weeks. I’m sad that the group is ending since I’ve been a part of it since nearly the start, but I’m excited to find other groups to participate in as well. Seeing as it’s the fifth Monday in the month, its a themed reveal for the Secret Recipe Club and the theme for October is fall dishes. For as much as I’m not a fan of cooler weather that eventually leads into winter, I am definitely a fan of the foods. Apples, cranberries, pumpkin, squash, soups, stews…the list could go on. Anyway, I was assigned to Cheesecurd in Paradise, a blog I am very familiar with. Cheesecurd in Paradise is written by Ashley who lives in Wisconsin. She has a ton of hearty, comforting recipes on her blog that made choosing one dedicated to fall a difficult choice. 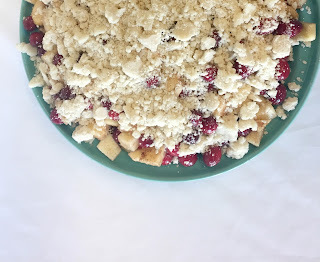 Eventually I decided on the apple cranberry crumble because I still have frozen cranberries in my freezer from last fall and really, no one needs to hoard 4+ bags of cranberries. 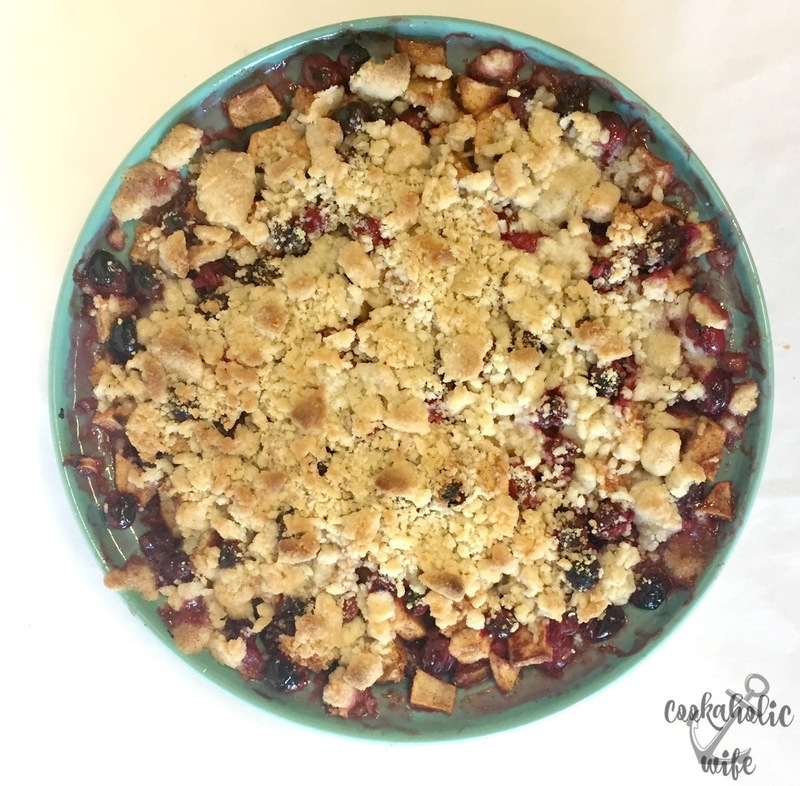 Cranberry apple crumb is a great breakfast or dessert in the fall. 2. In the bowl of your stand mixer, combine butter and sugar and beat on medium speed with the blade attachment until light and fluffy, about 3 minutes. 4. Combine the apples, cranberries, sugar, lemon juice and cinnamon. Toss to combine. 5. 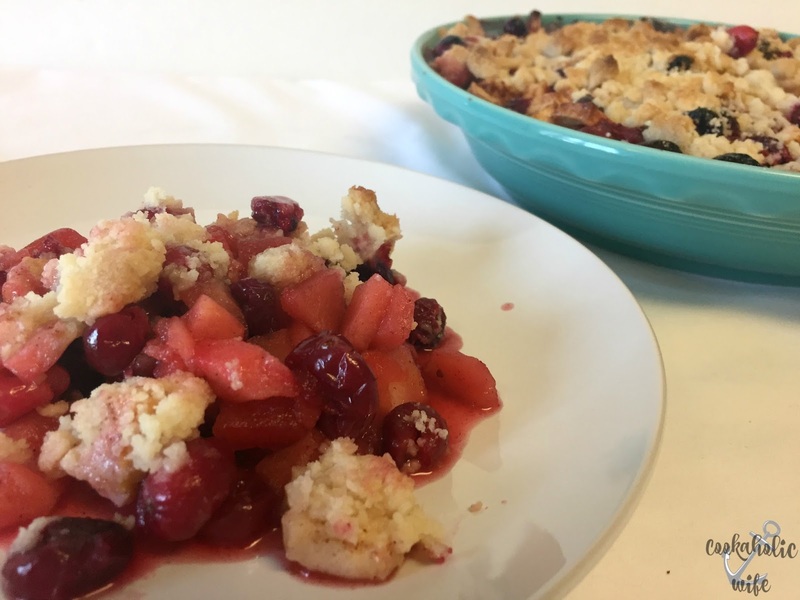 Pour the fruit into a deep dish pie pan or baking dish and top with the crumble mixture. 6. Bake uncovered for 45 minutes or until browned and bubbly. The sweetness from the apples and the sugar balance with the tartness of the cranberries perfectly, and the dense buttery crumble really makes this a super tasty dish. Good luck not eating it all in one sitting! haha, i still have 2 bags of cranberries in my freezer from last fall. you are so right – no one needs to hoard them, especially since they are back in stores now. 🙂 what a great dessert option! This looks like a perfect fall dessert – I always enjoy apples and cranberries together. I will also miss SRC… so sad it's ending! I've never baked with cranberries before, but it's time to change that! This crumble is perfectly fall and I love the balance of sweet and tart. I, too, am wondering where 2016 went! What a great recipe, and I love the combo of apples and cranberries. I've never put cranberries into a crumble before but what a fantastic idea! It looks delicious! I love the combination of apples and cranberries. Great SRC recipe! I love cranberries! With luck I'll be able to find some here in another few weeks. This is a great fall recipe – thanks! Apples and cranberries complement each other so well. I am sure that this was just delicous. Love apples and cranberries together. Perfect fall choice.